Lucien (Lucy) Minor is the odd duck in bucolic Bury. Friendless and loveless, young and aimless, Lucy is a compulsive liar, a sickly weakling in a town famous for brutish giants. Then Lucy accepts employment assisting the Majordomo of the remote, foreboding Castle Von Aux. 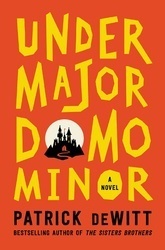 Undermajordomo Lucy discovers the place harbors dark secrets, including the whereabouts of the castle's master, Baron Von Aux. He encounters the villagers-thieves, madmen, aristocrats, and Klara, a delicate beauty for whose love he must compete with the handsome soldier, Adolphus-and love is a violent thing. Thus begins a tale of polite theft, heartbreak, domestic mystery, and cold-blooded murder in which every aspect of human behavior is laid bare. "An electrifying adventure, both tender and profane. Nervy, hilarious and utterly unpredictable, Patrick deWitt has served up another dazzler. "-Maria Semple, author of Where'd You Go, Bernadette?